Are your numbers on the classic bodyweight movements puffed up with some subpar reps? Here are the techniques standards you should be meeting to earn the respect of the masters! Throughout my career, I've observed and counted thousands of reps. Along the way, I've seen that the difference between a good rep and what I see some people attempting to pass off as one can be a pretty large chasm. 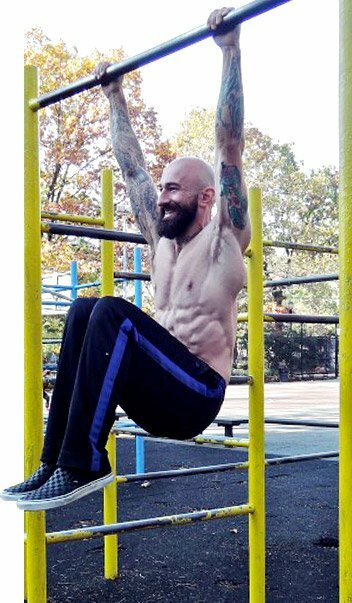 As lead instructor for the Progressive Calisthenics Certification, I've personally tested hundreds of aspiring trainers on the staple movements of bodyweight training. In order to pass the certification, PCC candidates must go through a series of 100 total reps consisting of squats, push-ups, hanging knee raises, and pull-ups known as the Century test. They have a total of 8 minutes to complete the test--including the rest between movements. Not every rep gets credited, and not everyone passes. It's easy to think that a pull-up is just a pull-up, but there are key details that can make the difference between a good rep and a cringe-worthy one. Here's what I look for in each of those four exercises. Ask yourself: Are your reps up to snuff? 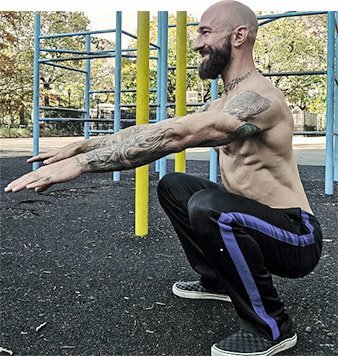 A perfect bodyweight squat begins with a tall chest, neutral spine, and flat feet. The toes may be turned outward slightly or the feet may be placed parallel—depending on individual factors, one may be more or less favorable. As the individual begins squatting, their hips should move back while their knees slide forward slightly, allowing the ankles to dorsiflex. The heels need to remain on the ground throughout the movement, however. One of the biggest issues I see when testing people on squats is failure to complete a full range of motion. In order for a rep to count, you must lower down until the tops of your thighs are at least parallel to the ground. Though this is less range of motion than what I consider ideal, just getting to parallel is still lower than most people think. A really impressive squat goes deep enough for the hamstrings and calves to press into one another. The range of motion at the top of the squat is also crucial. I've seen a lot of people shortchange this part by failing to engage their glutes and fully extend their hips, while others neglect to fully lock their knees. To get the real benefits of the full bodyweight squat, I can't stress enough how crucial it is to go all the way down and all the way up. It's so simple in theory, and yet many people still fail to do so. Arm position is up to the individual, but most people find that reaching their arms forward on the way down helps facilitate proper form. Ideally, I like to see a neutral spine through the entire range of motion, but with bodyweight squats, I'm willing to grant a bit more leeway than when a barbell is loaded on someone's back. Still, do your best to keep your chest tall and shoulder blades retracted during all squat variants, bodyweight and otherwise. People who are good at push-ups have a way of making them appear effortless. For this reason, it's easy to underestimate how much work can go into a proper push-up. Just like the squat, range of motion is often the biggest issue I encounter when testing PCC candidates on their push-ups. Failure to get low enough is a common problem, but locking out at the top is just as often an issue. In an ideal push-up the body should remain in a straight line from the back of the neck down to the heels the entire way up and down. A full push-up requires a minimum of 90 degrees of flexion along the outside of the elbow at the bottom of the rep, and a full extension at the top. It's also essential that the elbows stay fairly close to the trunk and are never placed at or above shoulder height. The knees should remain locked, with the feet together. Posture is often an issue with push-ups as well. It's all too common for folks to shrug their shoulders or allow their hips to sag when performing this exercise. In an ideal push-up, however, the body should remain in a straight line from the back of the neck down to the heels the entire way up and down. Think about engaging your abs and squeezing your glutes to help facilitate this. Female PCC candidates perform kneeling push-ups under the same guidelines, with the exception that the alignment be maintained from the back of the neck to the kneepits. The biggest thing to look out for when performing hanging knee raises is excessive swinging, especially on the lowering phase. Though a slight degree of wavering is nearly unavoidable, anything more than that is unacceptable. In order to help facilitate a controlled descent, it can help to think about reaching your legs slightly forward in the bottom position, almost like a gymnastic "hollow body" hold, to avoid picking up excessive momentum. Other than that, it's important to make sure you have a solid grip in order to maintain control of every rep. We also look for locked elbows and a straight back when testing hanging knee raises. Though range of motion is less often a concern on this exercise than the others that comprise the Century test, it is essential that the knees are raised to at least hip height for a rep to count, with the legs reaching a full extension at the bottom. Finally, focus on tilting your hips and pelvis forward at the top in order to fully engage your abdominals and make sure your knees come above hip level. The pull-up is the grand finale of the Century test and the most common roadblock toward passing. Like the other exercises, range of motion is often a factor at both the start and end positions of the pull-up. Your chin must fully clear the bar on every rep, and a full extension of the elbows is required at the bottom. However, simply completing the range of motion is not enough! The body must also remain relatively straight, with minimal hip or knee flexion. Though you obviously have to lean back a bit to avoid hitting your head on the bar any time you do a pull-up, your torso shouldn't have to travel very far forward or backward. Strict pull-ups are much more of an up-and-down movement than a back-and-forth swing. I also look for stable scapular positioning and proper abdominal recruitment. The body needs to be braced tightly! Female candidates perform the "Australian pull-up", also known as the bodyweight row. The same rules apply as far as keeping the body braced and utilizing a full range of motion. Explosive movements have a time and a place, but these strength training classics are best performed at a moderate pace. If you start going too fast you will inevitably break form. Clean, controlled reps should be your top priority. Focus on form first and it should help dictate your tempo. It's almost impossible to go too fast if you adhere to these guidelines. Remember, quality matters more than quantity. Aim to make every single rep your best. A perfect squat, push-up, hanging knee raise or pull-up is just like Supreme Court Justice Potter Stewart once famously remarked about another topic: "I know it when I see it." Show me yours if you dare! How to Cultivate Advanced Calisthenic Strength - Using the Power of "Beginner's Mind"
A Push-up For Every Occasion: 8 Variations For Strength, Power, Flexibility And More! If you only know a couple of push-up varieties and can keep repping them forever, you need a new challenge. Al Kavadlo has one—and then seven more! Sometimes the toughest strength moves don't involve any iron at all. Heed the call of the one-arm push-up and discover how tough progressive calisthenics can be! 7 Ways To Build Your Biceps Peak! Is your biceps peak looking more like a molehill than a mountain? Jack up your arms with these 7 peak-performance strategies!